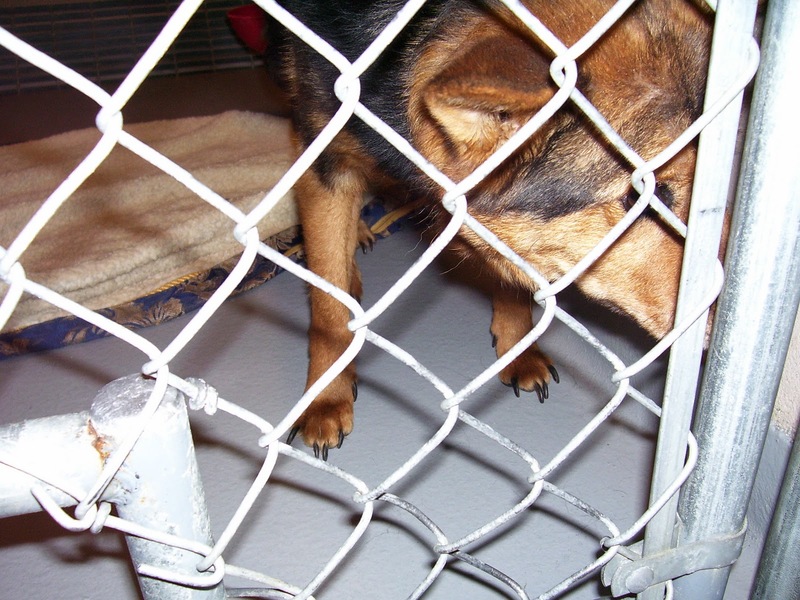 This Blog is for "Animal Lover's," especially "Dog Lover's." Read all about Shadow the Aust. 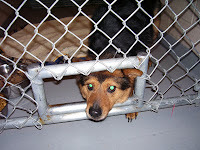 Cattle Dog I Rescued, this is such a sad story for such a sweet dog. Shadow's Story needs to be heard! Originally submitted at Pet Wellbeing Inc.
Found out my Sassy age 14yr has a malignant skin cancer that is very rare for her breed because it's more common in white cats. The only treatment is Radiation or radical surgery with radiation which I can't afford so for now she's on antibiotics and pain meds until I get the natural cancer remedy listed here ES Clear in the mail that I opted for. The natural med has a lot of promising reviews on this type of cancer so the vet told me it's worth a try after viewing the product and reviews himself.... say a prayer for little Sassy girl that ES Clear will work for her too! Once I start using ES Clear and I see improvement in Sassy I will update my review and post another photo of her prgress. The video shows how much Shdow has improved since his surgery, although he still doesn't have use of his right back leg which is still healing after his surgery and he has a kennel cough that is slowing but surely inproving. I took this video on my visit with him on Tuesday, Feb. 15, 2011. Shadow is such a sweet dog for all that he's had to endure in his life. Please find it in your heart to donate towards his Huge vet bill so I can bring him home to his Fur Ever Home when he's well. Now that I know his name is Shadow, when I visit him he responds to his name. He remembers me from day I rescued him. He wants out but sadly I can't take him until his assessment and paperwork are done. It's like he's telling me to "Please Take me Home." Finally rescued from the Humane Society I take him to the Clinic to repair his injuries. 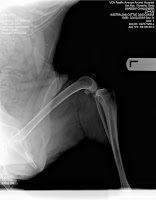 His back left leg and hip need major surgery to repair the damge from being hit by a car, not only once but twice! It's a miracle he survived this! 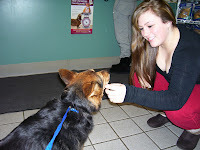 Shadow looks So content now knowing he's got a good Home and his injuries are going to be taken care of........ YEAH! On Friday, Jan 28, 2011, I saw a poor little dog with a mangled back leg trying to keep up with a man carring a huge backpak on his back... the poor dog was trying to keep up but having a hard time. At the time I saw him I was in my car on 136th & Meridian on my way home. I was So worried about the dog I turned my car around and went back up the street looking for him when I spotted both the man and dog in a parking lot. I asked the man about the dog and he said to me, "I'll sell you my car, title and everything in it to you for $100 and you can have my dog too!" OMG! I asked him why he would want to do that and he told me he had no money, no job, no home, his car battery was dead, out of gas and he couldn't feed his dog.... he said his dog was a real sweet dog who needed a home. I asked the man what happened to the dogs leg and he said he got hit by a car but he couldn't help him. I asked what are you going to do, can I help in some way? All he said was "it's all good" and before I had a chance to say anymore to the man he took his few belongings he had taken from his car and started walking towards the busy Merdian with the poor dog following trying to keep up. Well, this really tugged at my heart and if I had $100 I would have given it to the man but all I had was maybe $9 or $10 plus change so I parked my car and took off walking then running towards the man to give him what I had. When I finally reached the man I noticed his poor dog was no where to be found so I asked where he was and the man said he couldn't keep up would I find his dog and take care of him. Before I left him to look for his dog I offered him the money I had but he refused to take it... I begged him to take it and he called me "dear heart" saying he couldn't take my money, just take care of my dog. I told him I would. I found the dog up by the Sonics resturant with a man and woman who where both wondering what had happened because they worked at a nearby bank and wittnessed me running after the man. I told them the sad circumstances so they said they would call the animal shelter for me if I would stay with the dog (you see the poor dog was trying to find his owner so every man that would walk up the street with a backpak he would approach thinking it was his dad) this was so sad, I cried and asked God to help them, help them both. Well, I even tried to get the dog in my car, but it was no go he wouldn't or couldn't because of his damaged hind leg and there was no picking him up because of the pain he was in. I felt So helpless! Even if I took him home how could I afford the vet bills it would take to fix his leg? On a fixed income I can't afford much of anything! So when the Officer for the Pierce Co. Animal Shelter showed up I had to make the heartwrenching decession to let him go to the Humane Society where he could get the help he needed. I wasn't sure of his breed (to me he looked like a min. German Sheppard if there is such a dog) so I asked the officer and she told me he was a Red Cattle Dog. I can call the Humane Society to check on him she told me. I pray the're able to fix his leg and find him a loving home. I also pray for his owner that he finds a job, a home and happiness. "PLEASE CALL OR MAIL IN YOUR DONATIONS TO HELP PAY FOR SHADOWS SURGERY! THE COST COULD BE AS MUCH AS $3K SO PLEASE DONATE WHAT YOU CAN AT *253-537-0241* BE SURE TO USE CLIENT ID# 91184 When You Call Or Mail Your Donations! "MEET OR BEAT HER DONATION"
to meet or beat this pledge, this is a tragic story & could easily been me. Thank you all, donating was very easy, info is all here. 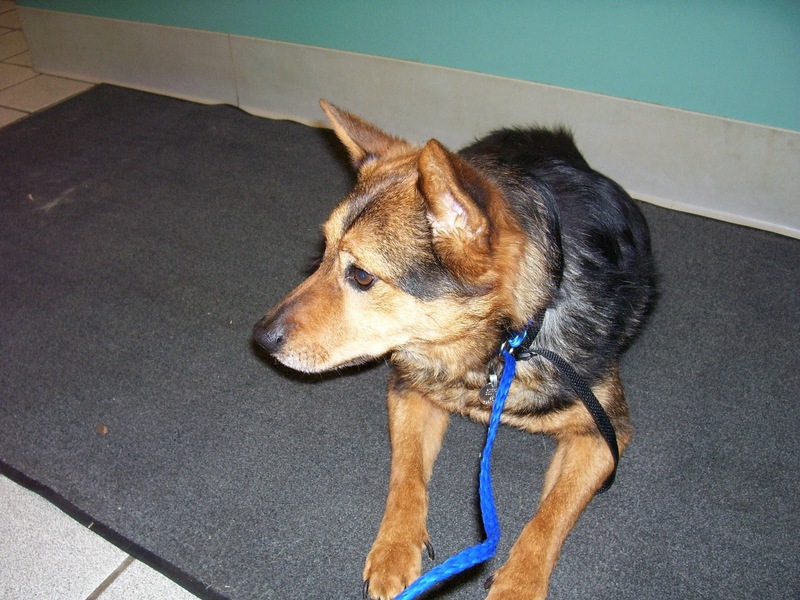 This little dog is waiting for treatment at VCA 24hr Emergency Clinic at 104th & Pacific Ave in Tacoma, WA. phone # 253-537-0241. As of yesterday he was resting comfortablly on pain meds but the vet hadn't examined him yet for his injuries pending notification of his owner (for a responsible party to pay the vet bills). When I called them and told the the whole story of what had taken place they told me they called the owners number but it was a disconected number. I'm assuming the dog had a chip and that's how they were able to get that info. Anyway, as it stands now this little dog has no one to help him (if I was able, I would but I'm on a fixed very limited income so I don't have the $2000 plus to fix his injuries). The clinic told me unless someone steps up to help this dog he would be sent to the Humane Society and I'm not even sure his injuries will be fixed first. In these hard times, no one has money but I'm pleading for donations none the less to help this little dog get his injuries fixed. My sister has donated $100 to the cause which is much appreciated so if you can spare a little something towards this I will be eternally grateful. I talked to the clinic just a few minutes ago and was told the Pierce County Humane Society picked the little dog up yesterday afternoon.... I was Shocked to hear this because his injuries have not been taken care of. The person I talked to said the Clinics doctor was willing to do the much needed surgery on the dog but the Humane Society took him anyway. They are closed on Sunday so I will call in the morning for more information about this dog and then post an update. 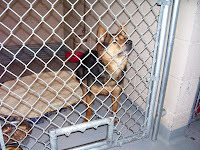 I called the Pierce County Humane Society when they opened this morning to check on the dog. I was correct in saying he must have had a microchip... anyway his name is Shadow and he's about 8 yrs old. I was told their Vet hadn't seen his injuries yet but before anything can be done (surgeries etc.) 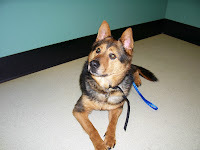 Shadow needs to go through a stress test and if he passes he can be adopted. 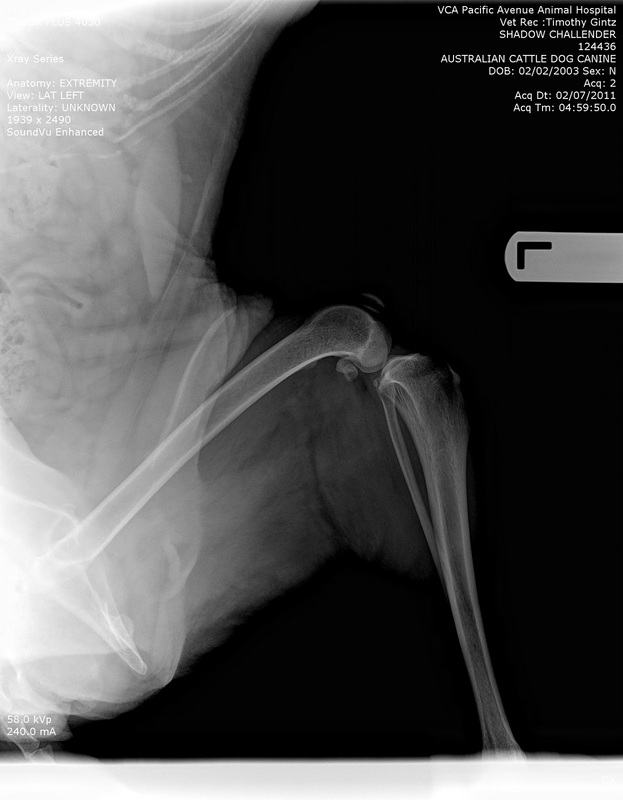 They told me if the surgery to correct his leg is more than they can deal with Shadow will be put down... OMG! I'm So upset by this news. I flat out told them I wanted to adopt him to make sure that doesn't happen but then I'm back to the same problem.... How to pay for his much needed surgery? They told me he still has to do the stress test and he could still be put down if he doesn't pass before I can even start adoption. I asked about getting pictures of Shadow so I can post them here but permission has to be given by the staff first so I just have to wait and see. I'm doing everything I can to save this dog and I still need help from anyone who is willing. I'm going to call the VCA Clinic back to see if they are still willing to do Shadow's surgery and if they are I desparately need Help with Donations to help cover the cost. I will keep everyone posted on the outcome of Shadow's fate. When I called the Humane Society again this afternoon I was told their doctor did not want to do the surgery on Shadow instead he should be put down because his injuries were too exspensive to fix and it wouldn't be worth it for an older dog of 8 yrs. Old, I said.... that's Not Old. My little Scruffy is 10 yr and Buddy 9 yr and they act like puppies! I begged them not to take those actions so I was told If I took him I would be totally responsible for the injuries. That's when I called the VCA Clinic and begged for help. 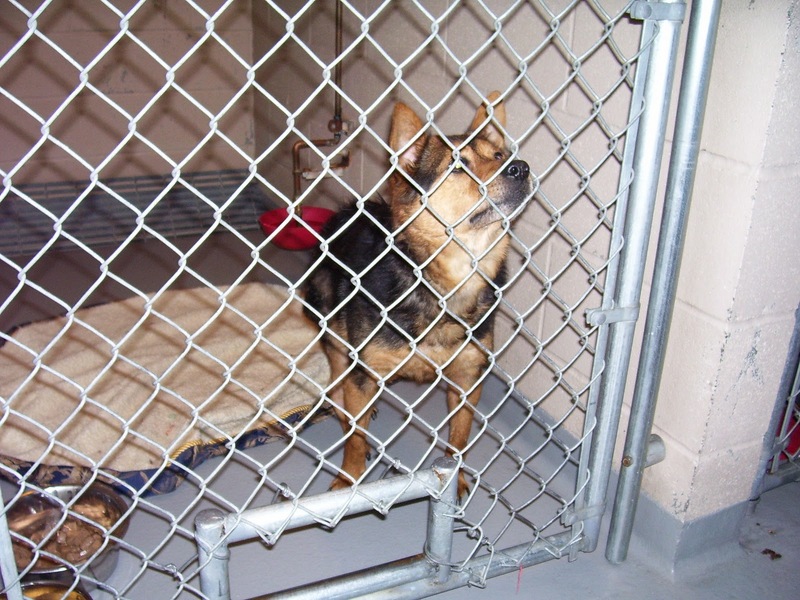 They were the people who originally got Shadow on Friday after the Animal Control officer took him from me. I got some good news from the VCA Clinic. They did take xrays when he was there and it appears Shadow has an old hip plate that started to fall apart or may have been caused when he was hit by the car, anyway his injuries are fixable and the doctor , a Dr. Gintz who called me said he would be able to work with me on the cost of Shadow's surgergy. He said he does have alot of injuries but he's willing to repair those to help. Praise God!!! I will see Shadow tomorrow when I go in to put a hold on him but I won't be able to take claim him until after Feb. 7th the Humane Society said. The doctor said that would ok because he's going to be out of the office till next Monday anyway. I took more pictures of Shadow and his temporary home (cage) and posted them along with the others taken of him so go see, a couple are really funny! I spoke to VCA Clinic today to set up an account for Shadow's Donations so if you want to Donate please see below where to send your Donation. The plan is to take Shadow directly to VCA from the Humane Society once he's mine and this could be as early as Saturday the 5th unless they change there minds about that date. 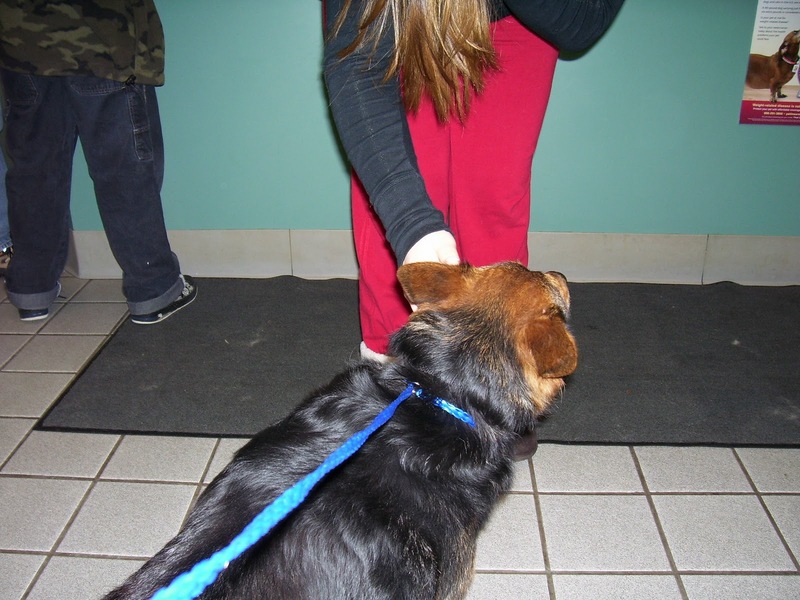 Once at the Clinic Shadow will be monitored with pain medications until Dr. Gintz sees him on Monday. I won't know his surgery schedule until then so I'll keep everyone posted on this. Another Plea for Donations So Badly Needed!!!! 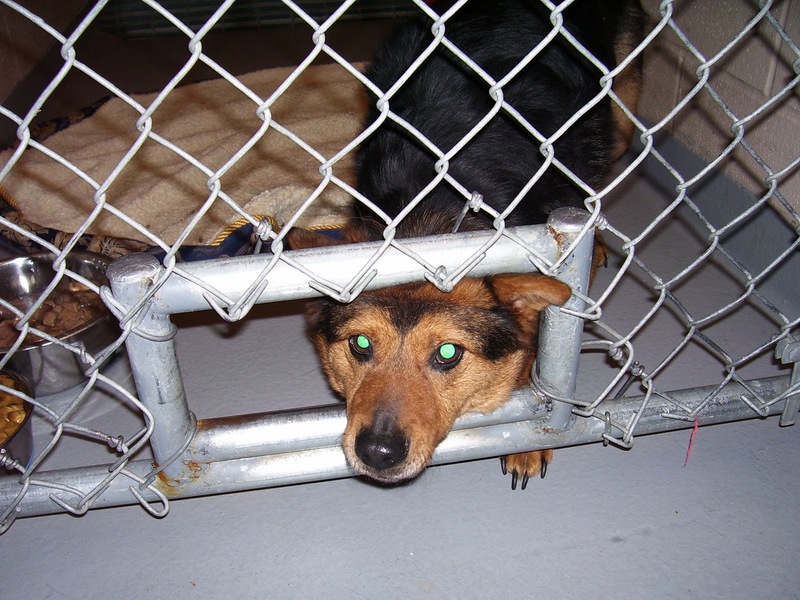 I talked to the Humane Society today to see if I can still pick Shadow up on Saturday. I was told the letter they mailed to his previous owner had been returned to them unknown so now all he needs is to pass the assessment test. 3:15 PM Spoke to Marguerite and recieved an email from her and everything looks good...she's very confident Shadow will pass the test. Below is the email she sent me. Hi! We are going to try really hard to do his assessment this evening, and if not, than definitely tomorrow morning. So he could go home tomorrow afternoon or Saturday if that’s better for you. Yay! I won’t be here tomorrow or Saturday, unfortunately, but Kathleen (the Executive Director), will be here Friday until 4:00, and I’ve asked her to say hello and thank you in person. Thank you again so very, very much!!! I hope you will keep us updated on his progress, and send us photos. I’m hoping to do a story for our next newsletter, if I can condense it enough! The news I got this morning from the Humane Society is that Shadow will have his assessment test early tomorrow morning before they open at 9:00 AM. I will be there to transport him to the Clinic after all his paperwork has been completed and from what they are saying is, it could be a very long wait being a busy weekend. Thank goodness the Clinic is open 24 Hours. In the meantime PLEASE CONTINUE TO SEND YOUR DONATIONS TO THE CLINIC USING ClIENT ID#91184 IF YOU USE A DEBIT OR CREDIT CARD..... SCROLL DOWN FOR THE ADDRESS TO MAIL YOUR DONATION. He's at the Clinic Had his wellness check, flea meds, antibiotics for maybe kennel cough not sure yet but he was sniffling alittle when I had him in the car on the way to the Clinic. 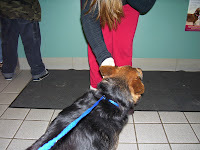 A Dr Ritcher examined him and gave me a disc of his xrays plus got some pics to upload, one with the Dr and Shadow. 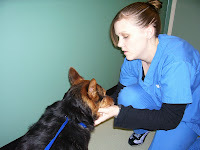 He'll be assisting Dr Gintz with Shadow's surgery possibly on Monday. Won't know what the total cost of his surgery is till then. Also Would Everyone Please Click On The Share Button Under Shadow's Story Link To Add His Story To Your Profile..... Please!!!!! Shadow's resting comfortably with no signs of kennel cough (whew!) He's scheduled to see Dr Gintz tomorrow to schedule his surgery. I'll keep you all posted on his progress but in the meantime for those that haven't already PLEASE!! Find it in your hearts to make a DONATION for SHADOW"S surgery! Any amount is So Much Appreciated. A current list of DONATERS is shown below: PLEASE!! Call 253-537-0241 and use Client ID# 91184 to Donate by phone or mail your Donation to the address below for VCA. Shadow and I Thank You All for Caring About Him. Got an early mornng call before 6:00 AM from Dr Glintz. 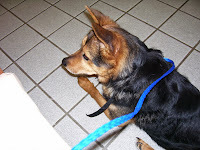 Surgery for Shadow started just before Midnite and ended about 5:00 AM. Shadow's resting comfortably on morphine and epidural to numb his legs, hips for the pain. He said surgery went well but his injuries were much older than we originally thought they were so that made repairing the bones more difficult. 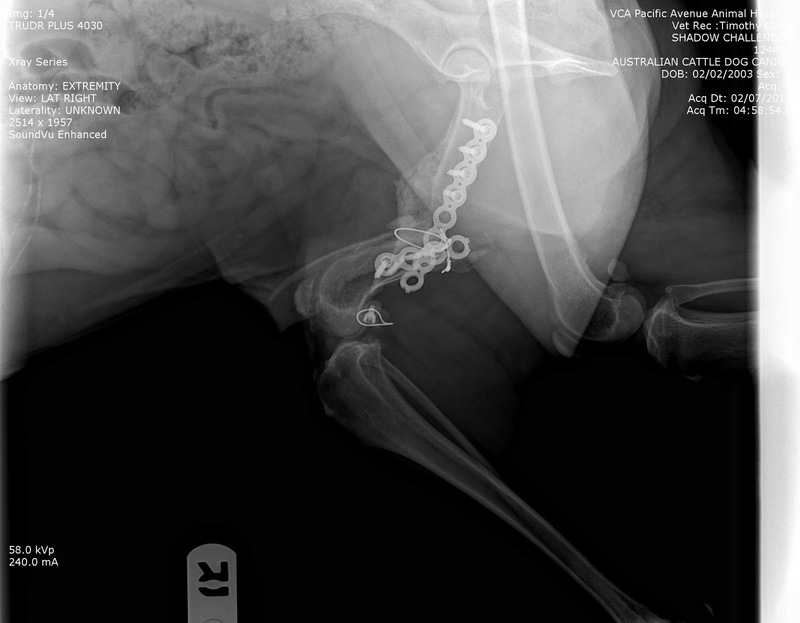 His right hip injury was much worse too so Shadow is going to have difficulty using that leg (both legs) for a while. He had to shorten the bone to make it fit together on the left fermor with a new plate and screws. Recovery could take a little longer and he won't be able to walk on either leg for awhile but Drs. confident Shadow Will recover nicely. He will have a limp all his life because of the right hip injury (it was So old he could't reset it like he wanted to.) 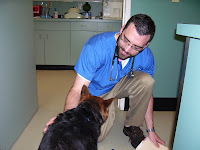 Dr Gintz was headed home for some much needed rest and then back to the Clinic at 9:00 PM. He told me to call him then for an update and any questions I had. I wanted to ask How Much this actually cost but thought I'd wait and ask him tonight. I'm sure Shadow's recovery will be part of the cost. SO Please Everyone! Please Keep Those Donations Coming! I'll UPDATE again when I find out anymore. Talked to Dr Gintz in the early morning and Shadow is resting comfortably but he's come down with a cough and sneezing. Doctor said he could possibly have kennel cough after all which is associated from being a Rescue. Shadow's currently being treated with antibiotics for his cough and morphine for his pain. The epidural seems to be wearing off so eventually he'll be able to move around a little. Shadow could be in recoverey for a full week doctor said. I plan on visiting Shadow sometime today and taking a few photos of him to add to his collection. I'll Update agin after I see him. Clinic until he's well. I did take a couple more pictures that I will post later and I'll be seeing Shadow again tomorrow just so he know's I Love and Care about him. I visited Shadow again on Sat., Feb. 12 and he was shivering and still coughing badly. He had been outside to potty when I showed up to visit so they didn't get a chance to dry him. I was in a room waiting when they brought him in so I took paper towel from the dispenser on the wall and dried him off. Just like my other dogs, he loved it. I spent about an hour with him, he even played with me alittle using his mouth like dogs sometimes do. He didn't seem as tramatized when I left because the vet tech put him on a leash and lead him out of the room we visited in just before I got ready to leave. 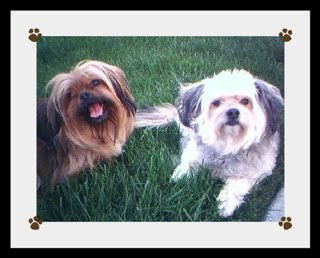 I'm taking my 2 little dogs (Scruffy & Buddy) to see their Vet on Monday to update vaccines and get the Bodetella spray up their noses for the kennel cough. As soon as Shadow's better I want to bring him home but not before I do the meet and greet with my dogs. I don't think I'll do it at the clinic though....too many sick dogs going in there so maybe at a park or my daughters in the Valley. Sorry I didn't have an Update for Mon. other than Shadow was resting comfortably except for his bad cough. I wanted to see him yesterday but was unble to so I went today bearing treats which he was So excited to get. His cough is alittle better today, he didn't cough much at all during the hour I spent with him. I got to take him out to go potty but the poor little guy was having a hard time walking, just dragging his left back leg along..... I felt So bad for him. I took a few more photos and a short video that I'll put up for everyone to see. All the doctors at the Clinic feel it's best Shadow stays until his kennel cough is completely gone so I won't be able to bring him to his furever home for at least another week to 10 days. Poor guy, I hope he doesn't feel abandon again even though he has all the Clinic staff spoiling him daily. I'm finally bringing Shadow home today But, before I do, I need to Update his information with everyone! It's "VERY IMPORTANT" to note that Shadow's Donations are no longer being accepted at the clinic since Shadow will be in my care. So, I'm asking anyone who wants to make a Donation to please mail a check to the "NEW ADDRESS" listed below. The Total Cost of Shadow's Bill was a Whopping $3,637.34. Your genious Dontions brought the balance down to $2,997.00 but I still need your HELP! I still need to rasie enough to pay for his surgery and stay at the Clinic. What Ever you can do would be So Very Much Appreciated So Please Mail Your Check To The Address Listed Below. Thankyou Everyone For All Your Support To Save Shadow! Great Shops for the Animal Lover! Meet Scruffy & Buddy, my sweet little boys! They have been my babies since they were 2 mo old. 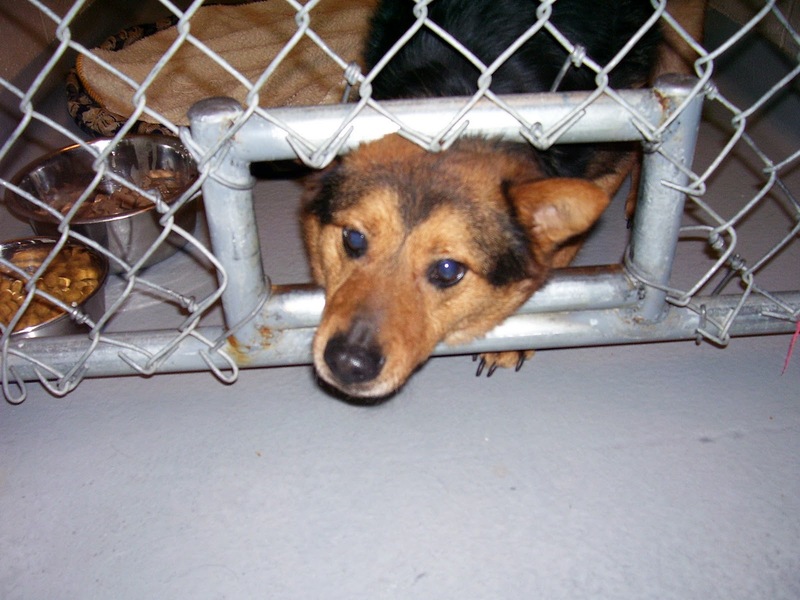 Scruffy is a mixed breed of Yorkshire & Pekingnese, he'll be 9 yrs. on 10/28/2009. Buddy on the other hand is a mixed breed of Australian Silky Terrier & Toy Poodle and he turned 8 yr. on 05/25/2009. The boy's just wanted to let you know what we've been working on to help us pay for the vet visits, food, treats, toys & anything else a dog might need, since the ecomomy has got so bad. So, for the millions of Pet Owners out there we created some great shops to hopefully help! Our next two shops are mostly for the pet owner with the exception of dog shirts of course for you're favorite Canine pup. We have some pretty cute tees & other things for animal lovers & some great gift ideas for pet owners too! You can check out these shops at the links below! Please Check in Often For Updates To These Shops! Check Out these Great Links Too! at the Humane Society after I rescued him, just wating until I can again free him from his pain. I've been an animal Lover all my life and a vegetarian for several years now. I hate it when I see anyone abusing these awesome creatures God has given us to take care of.